« Still Downloading Win7…Believe it or not! 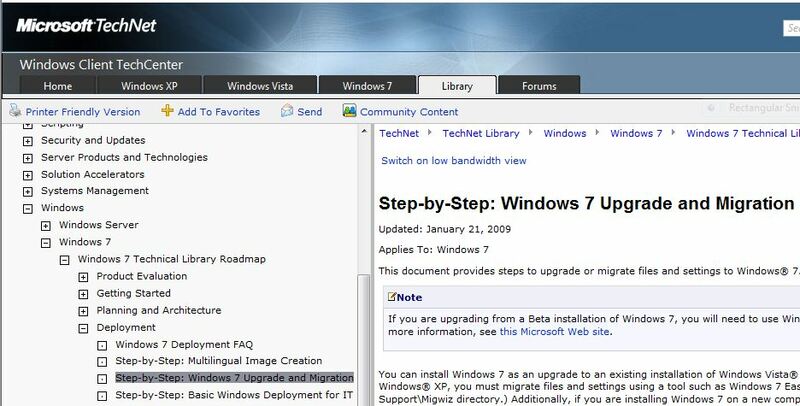 I stumbled across an interesting TechNet Step-by-Step piece this morning as I started researching the Vista to Windows 7 migration subject. I just upgraded two machines over the weekend, in the wake of the RTM release to MSDN at noon CDT on Thursday. Once the downloads were completed (that took until just past midnight Friday night, in my case to get 32- and 64-bit copies of Windows Professional and Ultimate), I started cranking away at installs for my 64-bit test machine (which also got an upgrade to 12 GB RAM at the same time) and for my 32-bit production PC as well. To those scenarios, I’d also recommend that organizations with some budget also look into the Laplink one-time upgrade/migration licenses. These retail for $65 each on a one-off basis, and can probably be purchased in bulk at some kind of discount (hopefully substantial), and permit applications to be migrated along with files and settings from most older Windows OSes (especially Vista and XP) to Windows 7. This can make the job of migrating machines must easier for admins who may need to do this pronto for some existing installs. Let me also observe that my experiences in installing Windows 7 so far have been uniformly positive and mostly-problem free. If you want the gory details check out this morning’s ViztaView blog “No Joy on In-place Upgrade; Clean Install Succeeds,” wherein I provide a blow-by-blow recitation of my recent experience in moving my problem-plagued production PC from Vista to Windows 7, with 98% positive results and a solution for all my software problems along the way.